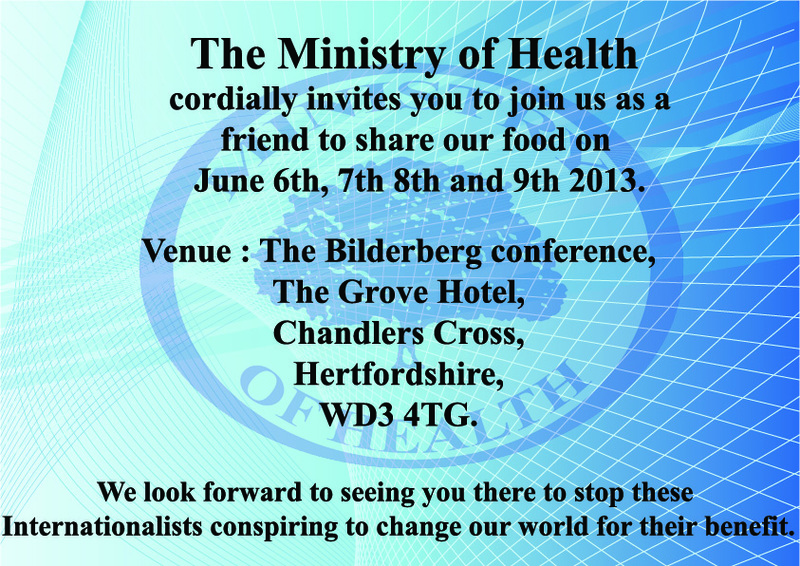 The Ministry of Health will be attending the gathering outside the Bilderberg conference in Watford on the 6th, 7th, 8th and 9th June. We will be supplying food to our fellow protestors and would very much like to see you there. If you can’t make it, then maybe you would like to donate for the food for the people turning up. They are there for your benefit also. Here are the costs. You can donate at http://www.ministryofhealth.org.uk and follow the donate button. We are committed to stopping these people from their heinous deeds and to spread the word on good health and the deceitful agenda that is being pushed onto humanity to make us diseased.